One item that drives the conversation this way are the reports we get from the current City Manager. 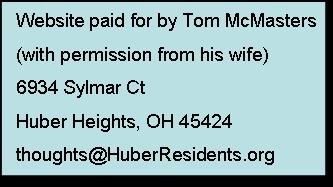 Having council schedule a real conversation, that includes real reports as read ahead materials, has the possibility to relieve some of the desire for me to serve as mayor and allow me to concentrate on the political issue I would prefer to work on. That currently is to Reform the Ohio Judicial System. Seeing this read ahead material and relieving some of that desire makes me happy. I had already recorded the verbal report the City Manager gave back in January about the 2018 season. Back then he stated the 2018 profit was $770,000 to the city. When the minutes came out all they said was the music center did really good. I was worried I would have to point out that without a full written report we could have another incident like the first year where he told us we made $300,000 and if I hadn't pressed for real numbers, we would have never known we actually lost close to $200,000. Thankfully, the written reports in this read ahead signifies we do not have to worry the written reports will be hidden. We get the opportunity to the see numbers to make sure they make sense. On that note the final revenue and expense numbers for 2017 had already been published in the December 2017 City Manager Report. These numbers do not match the numbers in the read ahead for tomorrow. So I am glad council has the opportunity to come fully prepared to discuss the issue and clear up the differences. These reports are in similar formats but they are not exactly the same. The report provided in the read ahead material shows the profit split with the management company. The one provided in the city manager report stops before that. Even though though the reports use the same names, the two net incomes may have a slightly different meanings. It is nice that council had the opportunity to see this before the meeting and I look forward to hearing the explanation of the differences. 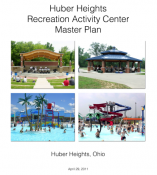 The December 2017 City Manager Report was published in March of 2018 so the numbers available at the time of publishing should have been as reliable as the 2018 report published this week. 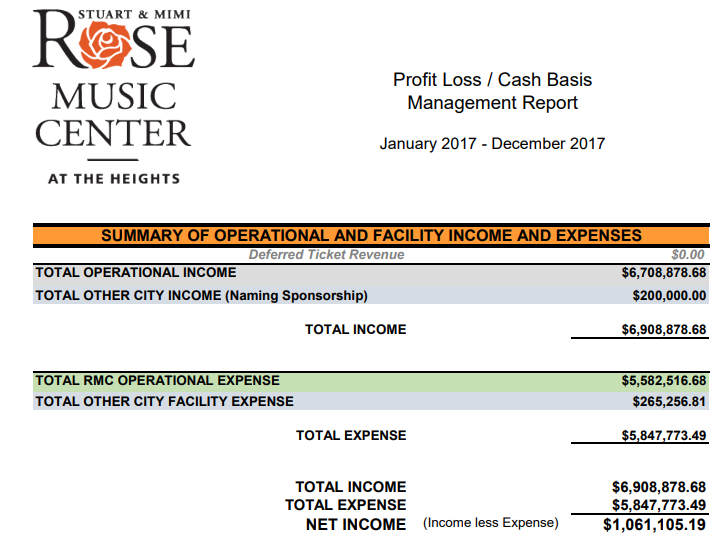 You can find the start of the Rose Music Center Financial report starting on pages 36 thru 38 of this 134 page report.